Created 23 September 2016 at 16:56 . Edited 2 January 2017 at 00:00 . This entry is No. 1 in a series of 14 entries. It has been an interesting year. I have not been employed, and have done almost no traveling, yet I have kept busy. There is much I have not yet accomplished, but I will need to rejoin reality soon. One last thing I need to do is finish this journal, so hopefully your reading this implies I have done it. This year I again trekked to Burning Man, and again it exceeded my expectations. In a way I didn’t expect much, for I didn’t complete many of my project ideas, and this would be the first time I went without a significant other. My camp suffered a failure of materialization. Not knowing where I would camp till I arrived was nothing new, but not having a group I was attempting to meet was new. Even within my small band of five people, just days before we left, two determined they would not arrive till halfway through the week. In many ways this year was shaping up to be a low key but hopefully refreshing year. I did expect I would have a great time, with vague hopes I would participate in more events from the guidebook (I didn’t.) and spend more time dancing all night (I didn’t.) and take more photos of people (I didn’t.). In place of what didn’t happen, though, was often a pleasant surprise. One goal I took more seriously this year was to record what I do in writing. During the other years, I barely took any notes. I managed to write a series of blog entries after my first year, in 2013, which were somewhat chronological but also organized into themed entries (1. The journey to Burning Man 2. Lazy days of building mind, body and soul 3. Radical self expression takes hold 4. Burning the Man 5. The ultimate burn). I intended to write again the following two years, but in 2014 I only posted a short recording of the temple burn (Temple of Grace’s beautiful return to Earth), and last year, I only managed a passing reference to my burn in the entry “Being myself”. It’s not that every year was the same and I had nothing further to say. Sure, I felt less pressure to explain Burning Man since I had attempted it before, but mostly, I prioritized work over writing, and my procrastination swallowed what potential remained. This year I again brought my laptop, hoping I might write a daily journal right on the playa. I never found the motivation to sit with my computer and write, though, so thankfully I had a backup plan: a notebook and pens. I made time to write brief notes of what I did, what we forgot, what we should do differently next year and anything else that came to mind. I couldn’t quite write my journal itself, but figured the notes would be far better than nothing, and I would hopefully be able to write at length shortly after the trip, based on the notes, somewhat like in my few experiences writing news articles. My timeline of notes still contains gaps despite my writing nearly every day, and they end at Saturday. I was exhausted by Sunday, and thought I should at least be able to remember the very last nights even if I didn’t write them down. But since I often forget whether I took my pills just minutes after I might have taken them, I should recognize my memory isn’t as reliable as I would like, or as it used to be. I didn’t complete sorting, correcting and captioning my photos till two weeks after returning. I hoped this process would take a few days, but I’ve struggled lately, and I’m not sure why. The process was quite cumbersome since I had to deal with files from my SLR, two compact cameras, a GoPro and my phone. 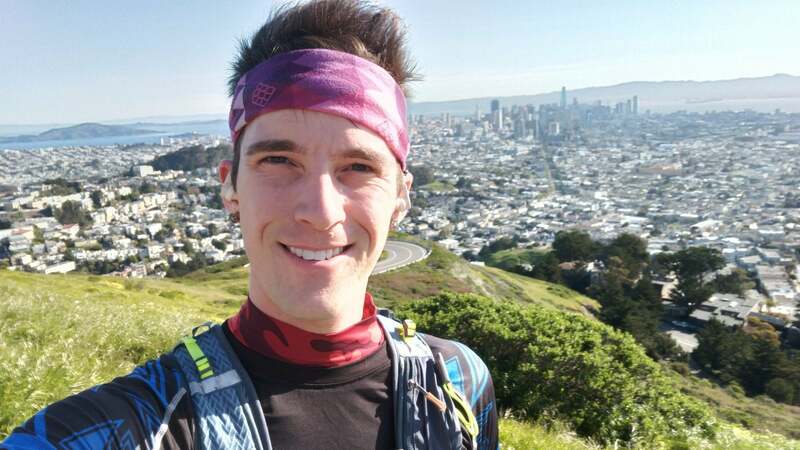 Despite thinking I set all the dates correctly before embarking, I still ended up with all the GoPro files claiming they were recorded 18 months ago, and one of the cameras was off by an hour, complicating my efforts to line up the GPS tracklogs. Further, correction was a mess, and I had trouble getting the photos from the various cameras to match in important ways, such as the color of the sky. At some point I had to give up and accept the photos would be more individualized than a set. Perhaps nobody would ever notice or care, and since this journal is ostensibly just for me, I shouldn’t either. Or maybe that’s why I should. I contemplated curating a higher organization to these entries than simple chronology, but since I have the notes and have no better idea at the moment, I will simply transcribe the notes, interweaving the photos as appropriate and including further thoughts should I think them. But first, some notes on our preparations this year. 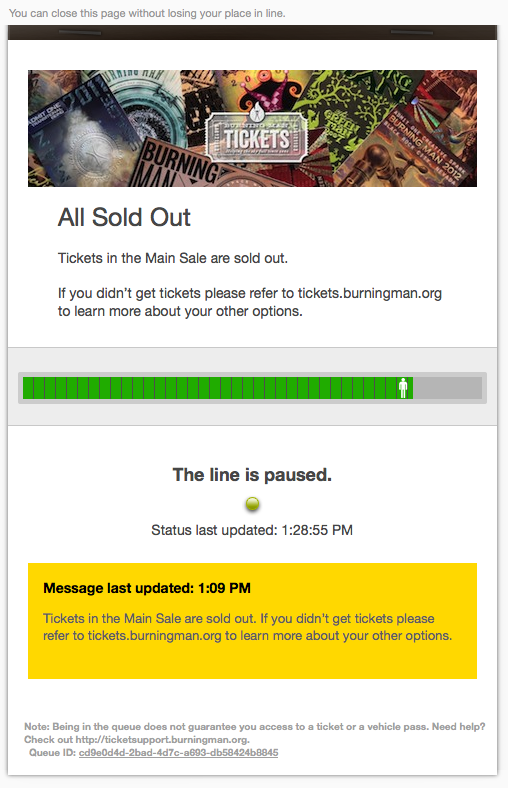 A friendly reminder that you are registered for access to the Burning Man 2016 Main Sale. In anticipation of high demand and a high server load, a 20-minute waiting room will open Wednesday, March 23 at 11:45am PDT. Actual sales begin at 12:05pm PDT. All of the last three years, I managed to get tickets in the main sale by logging on within seconds of the start time. This year, I would have no possibility of smartly timing to my advantage. And the result was I got no tickets. 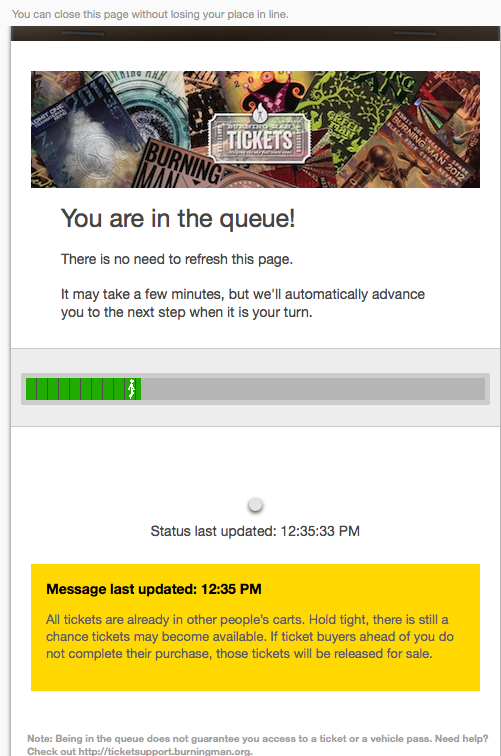 You are in the queue! All Sold Out / The line is paused. 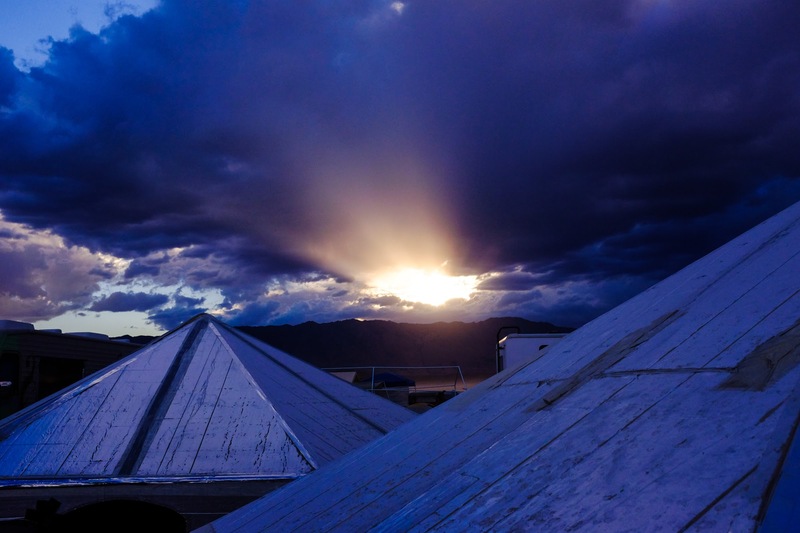 I never seriously thought I would skip Burning Man, but I also did not know what to expect. Demand seemed crazier every year. Last year some people had trouble getting tickets, but this year only a few of my dozens of camp mates succeeded in the battle. The ticket situation precluded early camp planning, as it would be many months before most people knew if they would be going. This dragged on into the summer longer than I should have let it, such that by the time Burning Man was a month away, Big Girtha still wasn’t happening. Most people who did get tickets already made plans with other camps, and while Danny and Brett did not have such alternate plans, they also were apparently both arriving later than me and on separate days at that. We made a last ditch effort to coordinate, but in our final week of preparation, my little yurt group had to plan as if we would be independent. This meant building shower and shade structures and having some sort of kitchen, which were all provided by our camp last year. Our plan was for me to drive my ex boyfriend’s hybrid SUV carrying Erik, his boyfriend Phillip, all of our gear and the yurt. Another camp mate Steven would be driving himself, so he planned to meet at my place Friday night and caravan with us. We would leave early Saturday in hopes of arriving by midnight, when we would register our location in the Center Camp directory under the camp name “Neblar”. (I initially liked the name when I pronounced it like “neb-lar”, but then I learned Phillip intended it to read “nee-blar”.) We would try to secure enough space for other past camp mates to join us, but could of course made no guarantees. Dave would join us again, but due to complications with his return from the Olympics in Rio, he would be driving from Chicago, and he would be bringing his friend Matt for a late Wednesday arrival. Originally we hoped to leave by 8 a.m. Saturday, giving us plenty of time to get to Black Rock City by the midnight gate opening. Then Erik started thinking we should revise this to noon, as we would almost certainly end up waiting for hours in Reno so as not to arrive too early and get relegated to the D lot. I was inclined to stick with the earlier departure, favoring waiting in Reno over being too late to claim prime real estate. My procrastination and typical packing delays ended up negating those concerns, as we left far later than either of us hoped, but it turned out all right. The story continues in The journey ‘home’.